The first thing I notices about this book, is that it is set in Canada. I appreciate the fact that this author did so, because most stories I read are set in the US or Europe. No joke, this is the first book I have read that has Canada as a setting. I guess that the Clare being from Canada has something to do with it. Nonetheless, I love that. The book itself was well written, and the story was well thought out. There is a complex reason for the happenings at Sparkstone, and you really have to pay attention to learn these things. I loved the little love affair going on on the side! It was adorable, and I think that everyone would like this light read. I am excited for the sequel, Dreams in her Head. I give this book 5 out of 5 book-a-saur paws! 1. 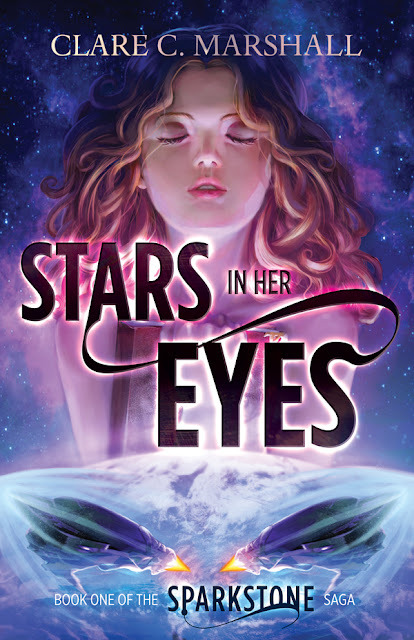 What inspired you to write Stars in her Eyes? I’m not sure if I can pinpoint a specific “ah-hah!” moment that inspired Stars In Her Eyes, but I wanted to create a story with a group of young protagonists with different powers, fighting an invading alien force. I’m a big fan of the Animorphs series and I wanted to create a series of novellas that was action-packed, full of mystery, and of course, has some really cool aliens and magic. 2. How did you come up with the story? It started with the characters. Originally I wrote this as a television series. I planned out one season with twelve or thirteen episodes, and wrote the first three. Then I left it alone for a while. Then I came back to it because I’d forgotten about it, and took elements and reworked it a lot. But the characters pretty much stayed the same. I wanted characters with different pasts and backgrounds coming together to fight a common foe. Even though I didn’t go into detail about each character’s history and relationships with one another, this will be the focus in the next few books as Ingrid delves deeper into her life and the mystery surrounding Sparkstone University. 3. Have you always wanted to be a writer? 4. How long did it take you to write Star in her Eyes? It took me about four to five months, with revision time included. I could’ve finished it faster, but I have this annoying tendency to stop writing at like the 90% mark and go off and do other things! I plan to write the first draft of Dreams In Her Head (Sparkstone #2) in like two months maximum. So far, I’m on schedule with this! 5. Do you have a favorite character? Hmmm. I like all my characters. I enjoy Sunni’s voice because she’s introverted, and even though we met her at the “end” of her story, she’s got a lot to tell--I’m probably giving her at least one prequel book, if not two. I really enjoy Misty’s character. Even though we’ve only seen her as an angry, driven young woman in Stars In Her Eyes, she’s actually got a very sad, moving past that we will explore in Stars In Her Eyes. 6. When is the second book coming out? 7. Are you currently working on other books? Always! J I am currently working on the sequel to Stars In Her Eyes, called Dreams In Her Head. It will be out March 13, 2014. I’m also working on the sequel to my YA Fantasy epic, The Violet Fox. It is called The Silver Spear. It will be published (if all goes according to plan!) June 13, 2014. 8. What genre is your favorite to write? I enjoy science fiction and fantasy, with some horror/thriller/mystery mixed in. Mostly I enjoy creating characters with complex and/or mysterious backgrounds and allowing my readers to discover their story. I also enjoy creating elaborate mysteries with lots of secrets that get slowly revealed! Which is what I’m doing big time with Stars In Her Eyes. 10. Is there any advice you want to give to writers out there? The best skill you can develop as a writer is time management. Don’t wait for inspiration to hit you. Make yourself sit down and write something. It’s the only way you’ll finish that novel you’re working on.